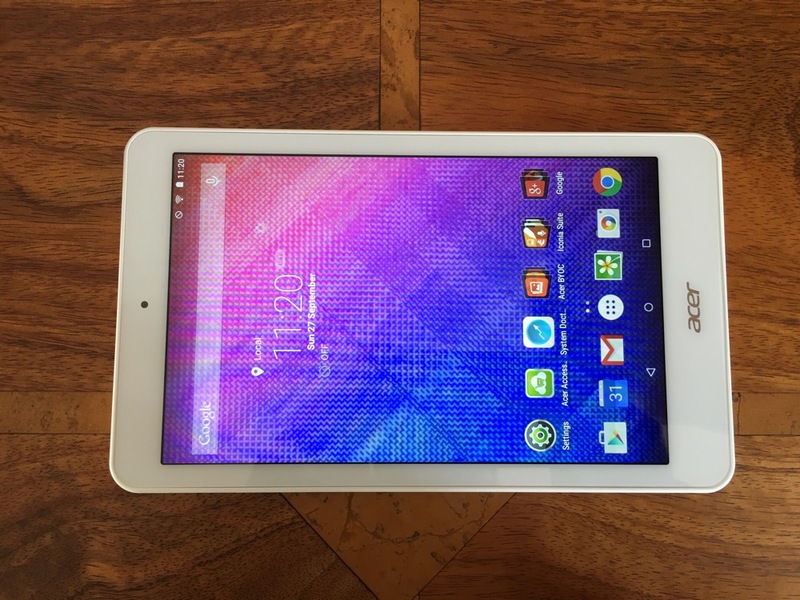 Welcome to my review of the Acer Iconia One 8 tablet review. This is a review unit provided by Acer PR which I have been using for over a month. The Acer Iconia One 8 is a 8 inch screen tablet available in 6 fashionable colours from white, two different blues and pinks and black. The tablet runs android 5.0 with an Intel Atom 4 core CPU running at 1.8HGz. AnTuTu kicked in at 33,198. It has 16gb storage with 1gb ram. The screen resolution is 1280 x 800. GPS is included as well as Bluetooth 4.0. It weighs 354g. Retails for around £125. The rear is has a perforated feel which makes it easier to hold. The button placement is slightly awkward as they are slightly recessed. One of the quirks of the device is the touchscreen which features Precision Plus 3 technology. With an Acer Accurate Stylus you can write and sketch with the idea to feel like you are actually writing on on paper. Acer also state that you can even use thin-tipped objects like pencils to make notes. I didn’t try this as I did not have a single pencil at home! Acer add a number of extra functions and apps, some of which are useful and others you may decide to park inside a folder. The Iconia suite includes EZ Note, EZ Snap, EZ Wakeup and EZ Gadget. The EZ Snap is a function when activated that allows you to capture screen shots with a 3 finger gesture. With 5 fingers you can wake up the tablet and launch your chosen app. EZ Gadget is a floating app with access to several tools – calculator browser, text memo and calendar. It stays in its own movable and resizable window on top of other apps. It is the size of 5 icons across, so remains fairly visible and easily accessible. A standard feature of Acer devices is BYOC. Bring Your Own Cloud. Activate these apps on all your other devices and you create your own private cloud solution for music, docs, photos, files and video. Neat. The screen resolution is 1280 x 800 which is whilst not the highest available does have a benefit of up to 10 hours battery life. In real world usage I got around 7.5 hours. The 16gb storage has around 8gb free after I installed a few apps. Smoothness. 1gb ram is just enough to keep this tablet providing a relatively reasonable experience mainly because it has a near stock build of android. Storage is expandable with a micro SD card. There are front and rear cameras, but you won’t be buying this tablet to take photos. The front camera is 0.3mp! And the rear is slightly better if that helps. The loudspeaker produces a clear sound maxing out at around 83db. 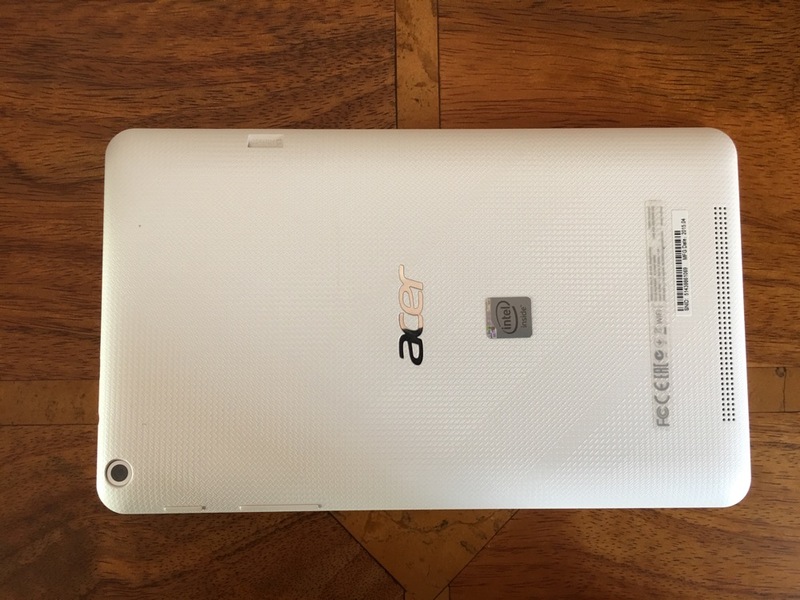 After using the Acer Iconia One 8 for a month I have no real complaints and some of the extra features and apps added by Acer were useful and others not. Note taking by writing on the screen was novel! At the end of the day it is an android tablet for around £125.